Delicious, Sweet and Fruity No Bake Tart that will be Perfect at Dinner Time or just for a Treat… I Love This Easy Fruit Tart! Sometimes I love to make a dessert that isn’t a cheesecake! I know right… it’s shocking. And although this does actually have mascarpone in it, I still don’t consider it a cheesecake as the amounts are different, and it tastes completely different. 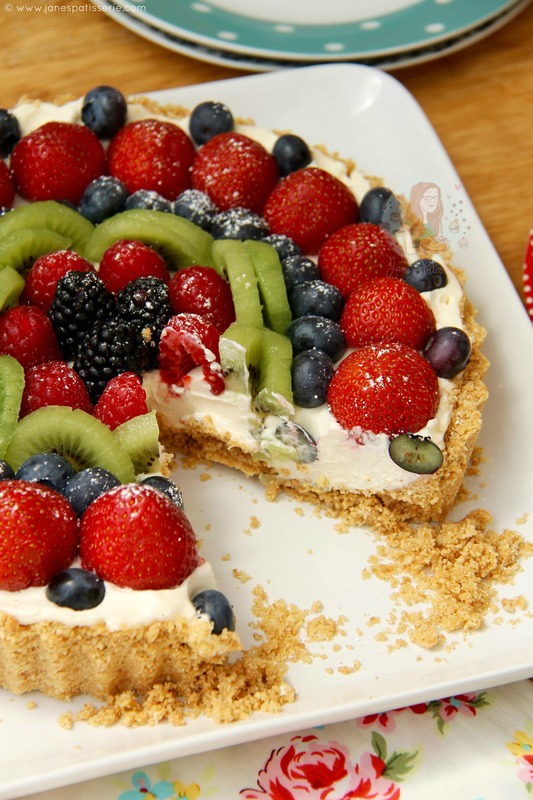 I wouldn’t however use Philadelphia in it as I don’t think it would work as well… but mascarpone is perfect! I used the same filing as I did in my Cookie Cream Pie, and the crust of my No-Bake Terry’s Chocolate Orange Tart! I’ve had a few people ask for a fruit tart recipe, and I decided to use a biscuit base, but you can easily make it with pastry instead if you’d prefer… use the recipe from my Salted Caramel Chocolate Tart recipe! I also had a few people ask for a Crème pâtissière filling, and that will be coming soon.. but with a different recipe! I’m saving it for something special. 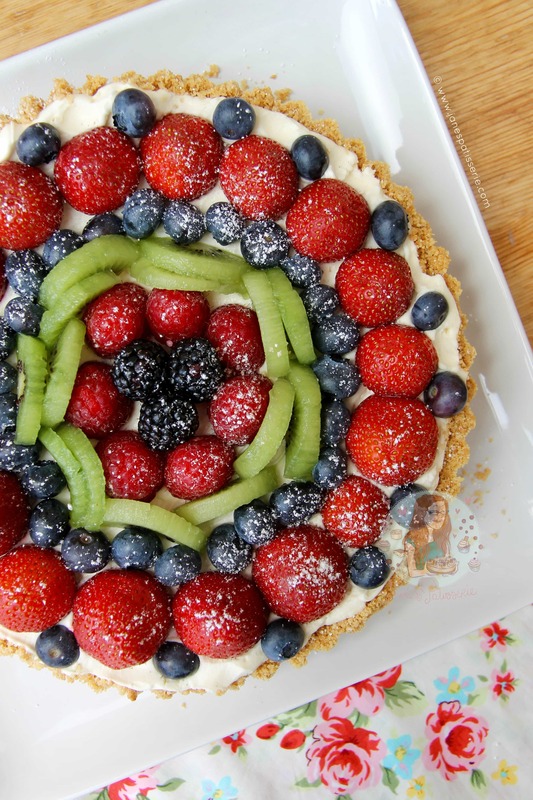 You can use whatever sort of fruits you like in a recipe like this, but I went for my personal favourites, and summer season fruits… Strawberries, Raspberries, Blackberries, Blueberries, and Kiwi!! Yum. I’m always a bit nervous of posting a recipe like this as I never think it will get as much of a reception as I’d like it to. I think recipes like these are so understated as yes they are easy, but they’re always a crowd pleaser and they’re so tasty to make! 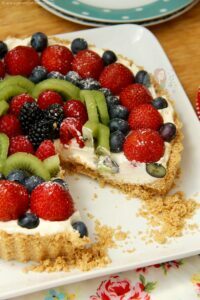 I can jazz this up so easily by using a different biscuit on the bottom, add a touch of rum to the creme filling.. or using crystallised fruit! It’s so simple but so worth it to know the basics, so you can experiment yourself! I obviously arrange my fruit in a certain way to make the fruit look pretty, but thats up to you. Mine isn’t symmetrical as I know id I wanted it to be, I would never be happy with the result.. but a dusting of Icing Sugar makes it look pretty as a picture and tastes perfect. 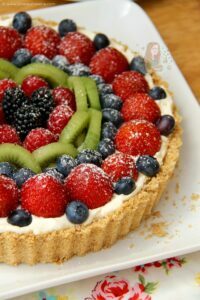 I use any leftover fruit from the ones that I have bought to add to the dessert, and its ideal! I love the fresh fruit mixed with the sweet filling, and the crunch of the biscuit base! Yummy! 2) For the filling, loosen the mascarpone slightly with a spoon and add to a bowl. Whisk together the Cream, Mascarpone, Icing Sugar, and Vanilla for 2-3 minutes until thickened considerably and mousse like – its not essential for it to hold itself like a meringue, just to be thick! 3) Refrigerate the dessert for now. Prepare your fruit by washing it all well, and cutting up what is necessary! I removed the tops of my strawberries, and skinned the kiwis then sliced them. The others I just washed! 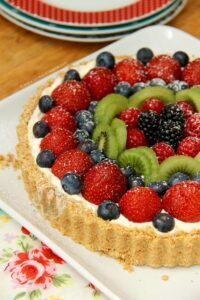 4) Arrange the fruit on top of the tart in a pattern, or pile it all on top… serve with some extra fruit, or a dash of cream! Enjoy! I just use an supermarket brand mascarpone. As this doesn’t 100% have to hold it self, you can get away with the lighter mascarpone if you like, but I wouldn;t recommend single cream as its too thin. 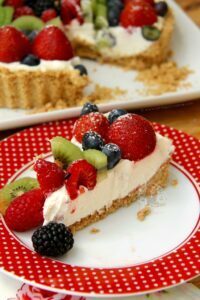 You can easily double up the recipe to make a bigger & deeper delicious dessert – add another half of the base recipe (I.e. use 450g Digestives, and 150g butter) and double the filling recipe! 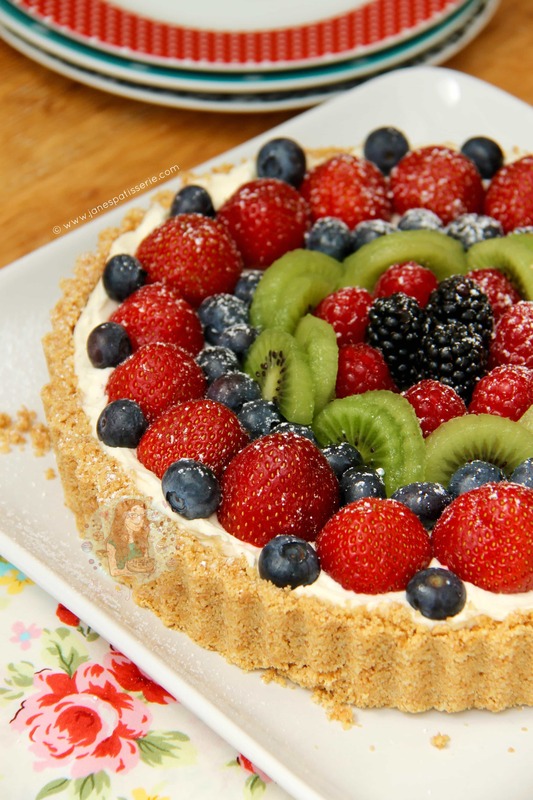 Use a 25cmx5cm deep tart tin! Older Next post: Malteser Cupcakes! 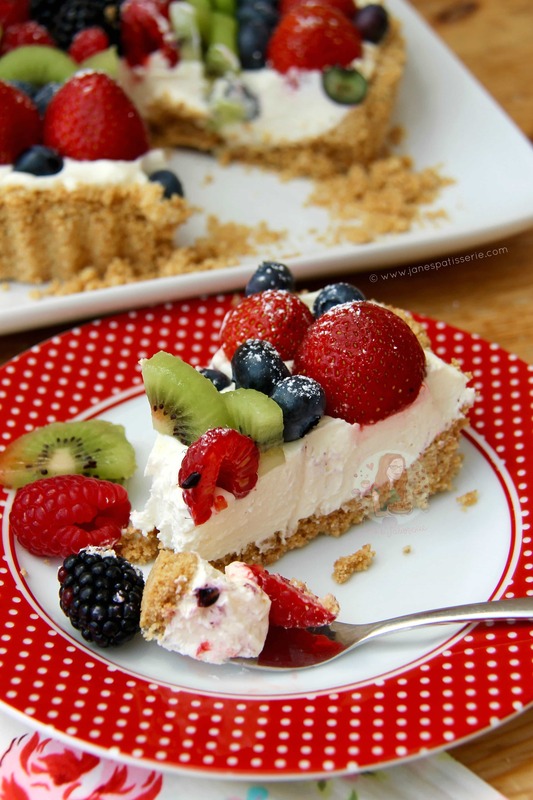 Newer Previous post: No-Bake Eton Mess Cheesecake! “…will last in the fridge for 2-3 days, covered.” I had to laugh … there is no way this will last that long in my house! Thanks for the gorgeous recipe; can’t wait to try it! Hahaha I have to say it, but it never lasts that long for me either ? I’m doing a Caribbean evening and thought this would make a simple perfect pud….how much rum would you put in the filling…. Or would it work better with rum double cream as a side? Thanku!! I made this the other day as I’d got friends over for a BBQ. Super quick, super easy and super tasty! Ahh amazing!! I’m so glad it was a success! This pie looks delicious ! I love the mascarpone cream !